For the language spoken in Uganda, see Gungu language. 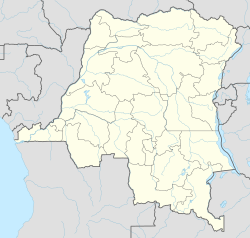 Gungu is a community in Kwilu Province, Democratic Republic of the Congo (DRC). It is the headquarters of Gungu Territory. The town lies on the Kwilu River. The estimated population as of 2012 was 23,893.Adolphe Muzito, appointed Prime Minister of the DRC in October 2008, was born in Gungu. ^ a b "Bandundu: largest cities and towns and statistics of their population". World Gazetteer. Archived from the original on 2012-12-05. Retrieved 2012-02-03. ^ Blaes, X. (October 2008). "Découpage administratif de la République Démocratique du Congo" (PDF). UNOCHA and PNUD. Archived from the original (PDF) on 2010-04-01. Retrieved 2011-11-22.